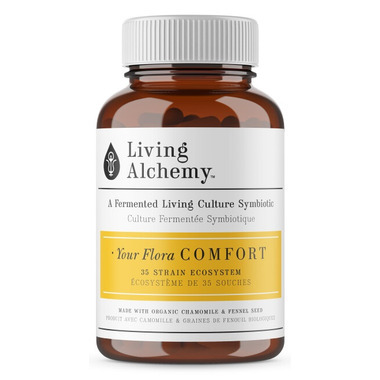 Your Flora COMFORT combines our fermented 35 strain Symbiotic with organic chamomile and fennel seed specifically for those requiring gut flora support with digestive gas and bloating or cramping. Caution: Contains soy. Consult a healthcare practitioner prior to use if you are pregnant or breastfeeding or if you have a fever, vomiting, bloody diarrhea or severe abdominal pain. If symptoms of digestive upset (e.g. diarrhea) occur, worsen, or persist beyond 3 days, discontinue use and consult a healthcare practitioner. If you have an immune-compromised condition (e.g. 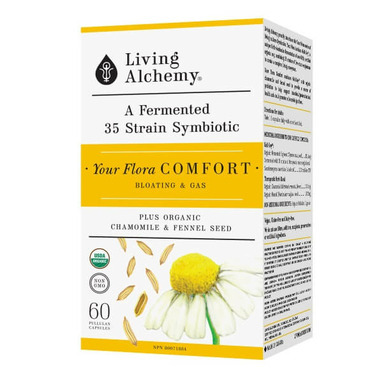 AIDS, lymphoma, patients undergoing long-term corticosteroid treatment), or if you are allergic to plants of the asteraceae/compositae/daisy family or of the apiaceae/carrot family, do not use this product. Hypersensitivity (e.g. 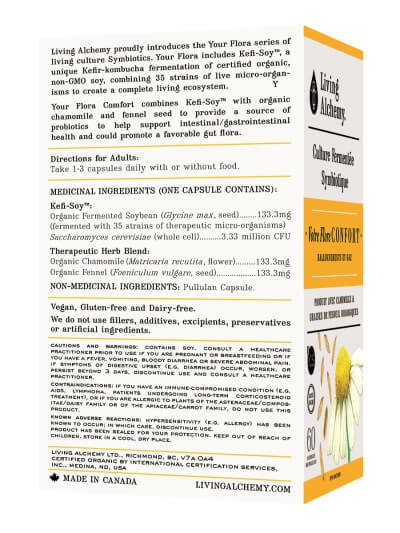 allergy) has been known to occur; in which case, discontinue use.